Home » Articles » Why Theater? My family has been going to and involved in the theater since my siblings and I were kids way back in the ‘60s. We didn’t have much, but when we went to the theater, everything seemed possible! People spontaneously burst into song and dance at the oddest moments. Characters appeared to fly, families seemed to love playing instruments together, and gangs seemed to prefer athletic dancing to actual fighting. Theater opens the eyes, swells the heart, engages the mind, and brings people of all backgrounds together. It offers tons of enrichment to children who become involved in its creative productions and programs. The theater program in which I was enrolled as a child taught singing, dancing, and acting — all skills I still use in the productions I create to entertain today’s children. When you introduce your children to the theater, as audience members or program participants, you’re opening them up to a world of possibility. Kids who become involved in plays and musicals gain many new opportunities to learn, grow, and discover. They can develop self-confidence and successfully interact with like-minded peers who appreciate what others may perceive as eccentricities. Children who have trouble focusing learn to hone in on daily and long-term goals, such as memorizing a few lines a day to eventually play a full-blown character or learning one step at a time for a complex dance number. There are chances for shy kids to become fierce leaders in various projects, whether they involve stage lighting or painting elaborate background sets. Those who lack self-confidence can discover their niche and be part of a team as they develop their social skills. Even if all they do is participate in the chorus, play an instrument off stage, or simply help to move sets, many kids still feel they’re an important part of something larger. They’re included, embraced, and praised for their participation in important roles. Theater programs come in the form of weekend workshops, summer camps, and after-school activities, so it’s easy to find one in your area that fits your family’s schedule. No matter what brings a child to a show or a theater program, he’ll get the chance to be creative and express himself in a positive way. So, take a child to the theater, and let him see the wonder, possibility, and hope. Then, try getting him into a program where he can shine. Watch him take that shine with him for the rest of his life — through school, relationships, and work — making each experience a little better than it might have been without. 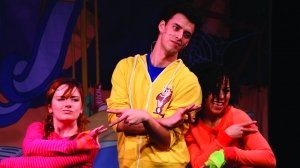 Marcus Ticotin is the writer, director, and producer of Freaky Pets Live, an exciting show for kids that’s full of nonstop dance, audience participation, comedy, music, and singing. For more information and a tour schedule, visit www.freakypets.com.